Jessica Greenbaum’s poetry has the joie de vivre of New York School poetics, tempered by the griefs and reflectiveness of an experientially tested soul. Confident in craft, substantial of heart, Spilled and Gone is the dexterous voice of a poet calling out to her earthly company of people and things, claiming and praising them. When I read it, I feel myself open and relax into the world. 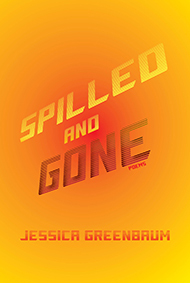 In her stunning new collection Spilled and Gone, Jessica Greenbaum transcends the limits of ordinary experiences, making of them indelible moments of human boundedness. We feel ourselves breaking in each heartrending line here, as houses crash down next door and lupines are all we have left – and when it seems our very souls might leak away, we are ultimately repaired by the poet’s abiding faith in life and love, like “the trees/themselves, how we depend on them to keep standing around us.” Such is the astonishing healing power of Greenbaum’s poetry, to admit freely our impermanence, and yet always to restore us. 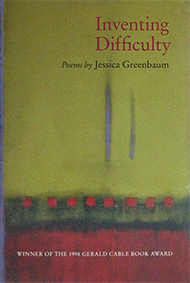 Jessica Greenbaum’s first collection of poems, Inventing Difficulty, winner of the Gerald Cable Book Award, appeared from Silverfish Review Press in 2000; her second book, The Two Yvonnes, has just been published by Princeton University Press as part of its rejuvenated Princeton Series of Contemporary Poets, under the auspices of series editor Paul Muldoon. Many reasons might account for a space of 12 years between one’s first and second books, including the vicissitudes of publishers’ tastes, trends, priorities, backlogs, and schedules; health issues; the birth of children (which can protract yet deeply enrich one’s development as a writer); and the exigencies of making a living. Artistic temperament is another reason. The extraordinary short story writer Deborah Eisenberg, recent winner of a MacArthur genius award, says that she needs time to “grow a new brain” between book projects. My former teacher Donald Justice worked slowly and used to claim that he wrote about one poem a year. I once heard Lucie Brock-Broido say at a public reading that she makes a point of waiting a ritual number of days between the publication of one book and the commencement of the next. And of course it is well known among poets that sometimes it takes a long time for even a gifted, prize-winning poet to find a publisher for the second. 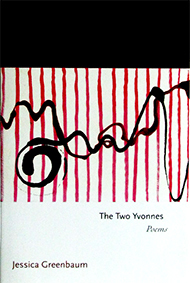 Whatever the reason for the decade spanning the appearance of these books, readers can be grateful that the poems collected in The Two Yvonnes are between covers at last. In it we find Greenbaum, in her clear, Brooklyn vernacular — usually in the first person — exploring the preoccupations of Inventing Difficulty: issues of story and history, of the places that we inhabit and those that inhabit us, especially the specular urban turf of the city. Unlike the kinds of difficulty in poems — contingent, modal, tactical, and ontological — typified and explored by George Steiner in his seminal essay “On Difficulty” (to which her title is clearly a shout-out) Greenbaum’s poems do not obscure with obdurate or arcane language, nor do they encode or leave the reader out, or challenge us with questions about whether or not poems exist at all. The net of language into the worlds Greenbaum evokes is transparent, quotidian, and accessible, which isn’t to say that the poems are not deeply complex and are, perhaps, even more so because of the clarity of their surfaces. “The Yellow Star That Goes With Me,” from Inventing Difficulty, for instance, is on one level a poem about first-world troubles involved as the speaker — thirsty, hungry — takes a crowded train ride into the city, but by the time we reach the end of the trip and return to the title, we realize that the speaker, hyperbolically “dying of thirst” and “absolutely freezing” and “painfully hungry,” carries with her always the truth of other dire train rides to death camps during the Holocaust. The difficult is “invented” here in that we are pitched one thing and given another, but the difficulty is real. heaven on earth. That day is related to this one. and who are you? You who I thought the star of my story? In this poem, and others in The Two Yvonnes, Greenbaum daringly floats her subjects over one another, and with this stylistic risk conveys a vision of the self that is at once coherent and essentially implicated in everything it is not. In “No Ideas but in Things,” Greenbaum writes: “We name life / in relation to whatever we step out from when we / open the door, and whatever comes back in on its own,” a statement that strikes me as an articulation of Greenbaum’s maturing style and stance in The Two Yvonnes. A sinewy, vividly intelligent humanity gives to this collection its memorable voice. In one sense, Jessica Greenbaum’s poems are incisively local—that Brooklyn landscape out of Whitman and Hart Crane. In another sense, however, they tell of the larger sadness and recognitions of our century. They “design their world through love” and scrupulous observation. A first book by a poet very much to be listened to. In a world both rich in close affections and awash in agonies we know only by rumor or report, Greenbaum writes her best self—eager, playful, responsible, beautiful. We need these poems, that show such power. I have known and admired Jessica Greenbaum’s work for many years. It keeps getting better—also harder to describe, in its entrancing blend of the hard-edged and lyrical, the chatty and tragic, the passionate and wry. Greenbaum is mistress of a recognizably urban but also piercingly individual style. Her poetry is full of brilliant phrases but it also respects ambivalence and loss, the silences between people and thing, the heartache inhering in the most loving family. Inventing Difficulty is a welcome debut volume by a wonderful poet. These are tough, passionate poems that spring from an urgency both intellectual and primal. They are wry, hilarious and wacky at times, heartbreakingly sad at others. Jessica Greenbaum brings a sparkling imagination and a vital, divine impatience to American poetry. How we need her, right about now!